Any good head sets I can use for riffing? My computer Mic is pretty crappy. What do you guys use for riffing (brand wise)? Re: Any good head sets I can use for riffing? For headsets, I'd probably go for a Logitec. I think that's the one I have, I'm at a different computer now so I'll have to check. Yeah well, that's what I used for my first riff. I don't know of a headset mic that would be an improvement. That's why I upgraded to this. 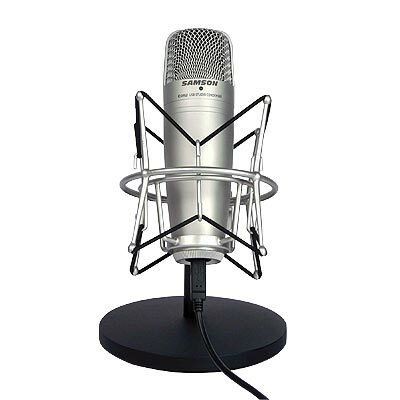 Samson CO1U USB Condenser mic. You can find some good deals on them on Amazon, but they are a step above headset mics in price range. That looks GREAT! I want it. Too bad it's high in price. Recorded both my riffs with this baby and I think it sounds beautiful. Cost $99.99 though. With the price though I figure I stand a chance to make my money back one day eventually so its worth it to make your riff sound good. I plan on continuing to do riffs for some time unless it turns out that people really hate my two current riffs and nobody buys them. So if you plan on doing more than a few riffs in your lifetime and think a decent number of people will buy them then its definitely a good investment. Thanks I'll have it in mind.